Today I met with a couple of dear friends over coffee and we had a thought provoking discussion. The nice thing about being an introvert is that when you get together with someone who is open to deep discussions, you can skip a lot of the small talk and dive into thought provoking topics. One of my friends asked me what my dreams are. Over the last two years or so, I’ve completely stopped planning for the future. Our adoption and parenting journey has been so rocky that the future is unpredictable. I could make plans at this point but it is highly unlikely that they would come to fruition. There’s just too much trauma and the effects of trauma in our home. In addition to a lack of planning for the future, I’ve forgotten how to dream. Because I feel so out of control in regards to the day to day, I don’t know how (and lack the emotional energy) to dream about the future. We have to parent based on our daughter’s current emotional status and that leaves little room for planning. But maybe I should start dreaming again. Maybe that will provide some hope in the day to day. I worry that dreaming again will frustrate me if I feel like the dreams are completely out of reach. But maybe they will be motivational to make some changes and encourage me to control the things I can control. I’m not sure if anyone is reading my blog anymore but I want to start posting again. Maybe sending my thoughts out into the world will help me connect with others. As my friend Julie says, we need to be willing to ask. So here goes – I need bosom friends. Maybe my words will touch someone and we’ll share our thoughts about life. If not, at least I started reaching out again. That is encouraging. I have very little time to write tonight. I spent most of my alone time taking a bath and then journaling. But I did want to take a moment to just acknowledge that it is a new year. A new start. 2016 was the worst year of my life. I hope and pray that 2017 will be better. I know that I’m willing to work hard to ensure it will be. We have officially survived Christmas. No rages. No real meltdowns. Just two whiny, extremely clingy children. I’ll take it. Personally, I experienced very little joy in the holiday. I wish I had found some joy in it but I didn’t. Survival is good, but I feel empty. I want to write a blog post soon about what I’ve recently discovered to be my biggest challenge in life – my complete lack of self-confidence. I used to have some, though I’ve never been a confident person by nature. Right now I have absolutely none. I feel like a shell of a person. Everything is a projection of confidence, a facade. I haven’t had the emotional energy to write the post just yet, but I am exploring the idea. After all, knowing is half the battle, right? It’s Christmas Eve. It’s been an interesting day. We made it to church this morning, for which I am very grateful! The day has been a bit tense but no major issues, another thing I am very grateful for. I know to take one day at a time, even one hour at a time, because the mood in our home can change so quickly. But right now, things are peaceful. My husband and two daughters are upstairs watching Star Trek. I’m downstairs on my computer, putzing around with reading lists and dreaming about the possibilities for next year. I find it encouraging that I can dream just a little bit. Realistically, I know that I’ll accomplish very little of my dream list as life is just too traumatic right now. But I’m an ambitious and motivated person. Over the next week I’ll put together my new year’s resolutions and my year’s reading lists and hope for the best. It’s been ages since I’ve blogged. I simply haven’t had the time or the emotional energy. I miss blogging. I miss sharing my thoughts, hoping that my words will reach some potential adoptive family. I miss connecting with others who are considering adoption or have adopted themselves or are homemakers and share some of my homemaking interests. Life is hard. Really, really hard. Since I last posted, I traveled to China by myself to adopt a 13 year old girl. 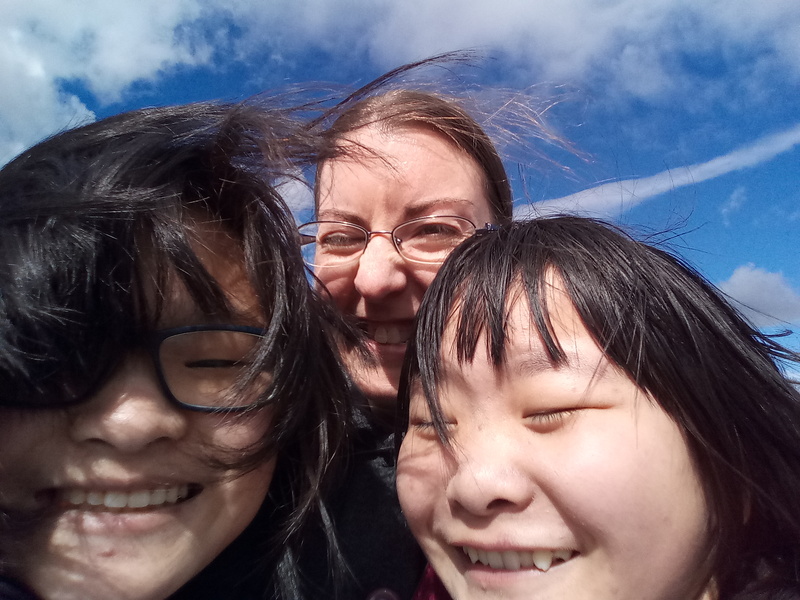 My husband and I now have two daughters, a 14 year old from Taiwan and a 13 year old from China. Both have documented physical needs but their most pressing need is to overcome all of the trauma they’ve endured. But they aren’t the only ones who have daily challenges. Both my husband and I have been heartbroken in the past two years. We have emotional scarring, some of which has healed and some of which is still raw and bleeding. We have a family therapist now. I can now claim an acronym of my own – PTSD. Daily life is a huge struggle. In the past few months, I’ve had two panic attacks and have fought off many others. I now have ongoing anxiety and am trying to get medical support from my doctor. Hopefully I can start sharing some of the struggles I face and lessons I’ve learned as an adoptive parent. This is not easy. I’m sure that some children come home and meld right into the family. Neither of my daughters have had that experience. It has been a rough road and I often lose hope that everyone in the family will heal. This is life. My life. It’s been so long that I don’t even know where to begin. And yet I want to try. I had hoped to blog through our older child adoption in hopes of helping others who are interested in adopting an older child. But our experience has been so difficult that I have not had the energy or time to write. Plus, I struggle with knowing how much to share. I’m very open with my side of our family life but I want to protect my daughter’s privacy. I have really struggled with parenting. My daughter has a very difficult background and has plenty of scarring to prove it. She does not know how to face life in a healthy way. It’s my job to teach her. Secondary PTSD? Yup, we’re familiar with it. I now have some of my very own trauma as well. I have been stretched, tested, tried, burned with fire… and am slowly recovering. I will start trying to share some of my story. It’s been almost two months since I’ve done any regular posting. I just don’t know what to say anymore. Life is HARD here. Teen adoption is definitely not for the faint of heart. Most days I feel like I should be classified as faint of heart… I do want to blog about our experiences but I linked my Facebook account to this blog and feel as if I am violating my daughter’s privacy. Too many people know us in person and I’ve had to request that they be careful not to discuss anything I’ve posted about the challenges of older child adoption. That’s not fair to anyone. I’m not sure what the solution is… stop posting my links on FB? Stop blogging altogether? I haven’t found a solution I’m comfortable with. Maybe once we’re past this crisis point, I’ll be able to blog about how things went and what we learned. Maybe at that point I won’t feel like I’m betraying my daughter by posting on the internet about her behavior. Maybe for awhile I should just blog about the happy aspects of our lives, though that’s definitely not a true perspective of what’s going on in our house. Not that I have much time for blogging anyways… life is rough!